Join horse enthusiasts of all ages as they get ready for another season of horse riding. Buy, sell and trade English and Western riding tack and accessories. Susan of Red-Tail Designs will be on hand showing her latest horse hair jewelry designs. 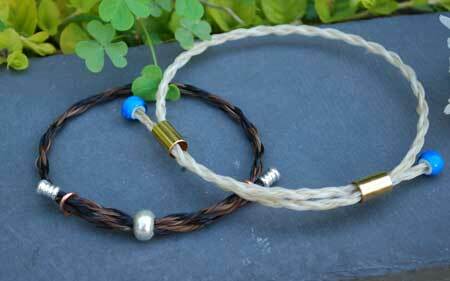 Come try on a bracelet or bring your horse’s tail so she can turn it into a one-of-a-kind piece of jewelry. Children get to step into the lives of Native Americans by participating in 7 hands-on workshops and 1 lifeway activity, plus hear story telling in this day-long workshop. I will be making yarn medicine wheels with the kids. $20 per child. June 8 – 9, 2013 at the Museum Of Indian Culture, Allentown, PA 11 a.m. – 6 p.m. Experience all manner of primitive art and culture at the Artifest. Located on the grounds of Museum of Indian Culture, Artifest gives visitors to experience history with hands-on activities and a multitude of demonstrations. (Teenagers and Adults) 2 hours. Before beads became popular, Native American Indians created colorful embellishments for clothing, pipes, and bags with a most unique material: porcupine quills. Join us as we explore this art form that dates to before the 1500s. You’ll try your hand at this ancient art as we learn how to plait quills (end result could be wrapped around a pipe, knife handle, or wood) and wrap quills to create a medicine wheel. Along the way you’ll discover the tools and techniques Indians used to manipulate quills into works of art, and we’ll peek into the unique life of the prickly porcupine. Pre-registration is required! Sunday, June 15, 2013, 1 p.m. to 3:30 p.m.
September 28, 2013 1 p.m. to 3:30 p.m.
(Teenagers and Adults) 2 ½ hours. Using dyed porcupine quills, you’ll learn how to create pictures and symbols on leather in the tradition of Lenape (woodland) and Plains Indians. You can help revive a dying art as you learn the fundamental stitches of porcupine quillwork. Attendance at the first workshop (Colors of the Past: Native American Quillwork) is suggested but not required. Pre-registration is required! Below are some of the other classes I offer. To be added to the waiting list or to schedule a class for your group, contact Susan. This class is currently not scheduled. Please contact me to be added to the waiting list. 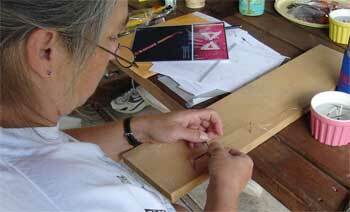 In this class you will learn how to “spin” individual horse hairs into “pulls” and braid them into a 4 strand braid. You will then transform that into a bracelet. If you have your own horse and want to use its hair, you can. Instructions on preparing the hair will be given when you register for this class. If you do not have your own hair, that’s fine too, as the instructor will supply some for you to use. 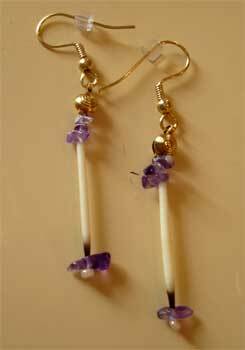 I’ll come to your stable and teach a class for your riders and boarders to create horse hair jewelry from their horse’s tail. E-mail or call me at 610-905-8399 to schedule a time. I’ll come to your 4-H meeting so you kids can make horse hair tassels from their own horses tails. I also provide hair for those who can’t bring any. The kids learn how to make tassels and get to pick beads to add to the tassels. I will come to your Brownie or Girl Scout meeting to teach the girls about beading, jewelry use around the world, and careers in the arts. We complete at least one project and can meet badge requirements. Contact me for more information.